A Detroit man with a suspect throwing arm is facing felony charges for attempting to toss a football stuffed with narcotics and cell phones over a fence and into the exercise yard of a Michigan state prison, investigators report. The alleged smuggling bid literally fell short Sunday morning when the football landed between two fences at the G. Robert Cotton Correctional Facility in Jackson, a city about 40 miles west of Ann Arbor. According to police, a corrections officer spotted Christen Deon-Sterling Moore exit a vehicle and toss the football toward the yard. Moore, 22, was then taken into custody by the prison officer. A subsequent examination of the football revealed that it contained marijuana, heroin, tobacco and three cell phones with chargers. 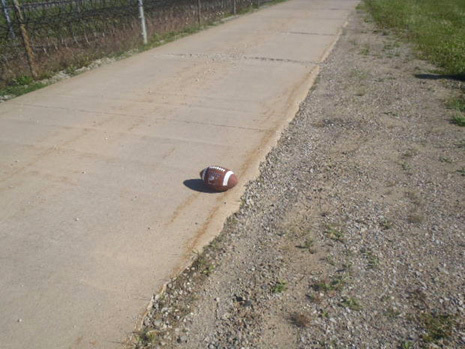 As seen in the above Michigan Department of Corrections evidence photo, the football landed on a pathway adjacent to the prison yard. Moore, pictured at right, was charged with three counts of furnishing contraband to inmates. It is unclear who was the intended recipient of the football’s illegal contents. 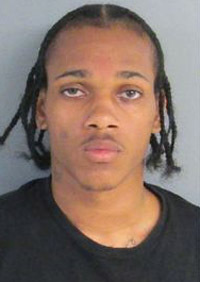 Arraigned today on the felony charges, Moore is locked up in lieu of $50,000 bond. Cops: Man Assaulted Pregnant Girlfriend Because She Didn’t Wish Him "Happy Father's Day"